Register for the 2019 Academy today - Scholarships are available! Do you want to play or sing beyond high school? 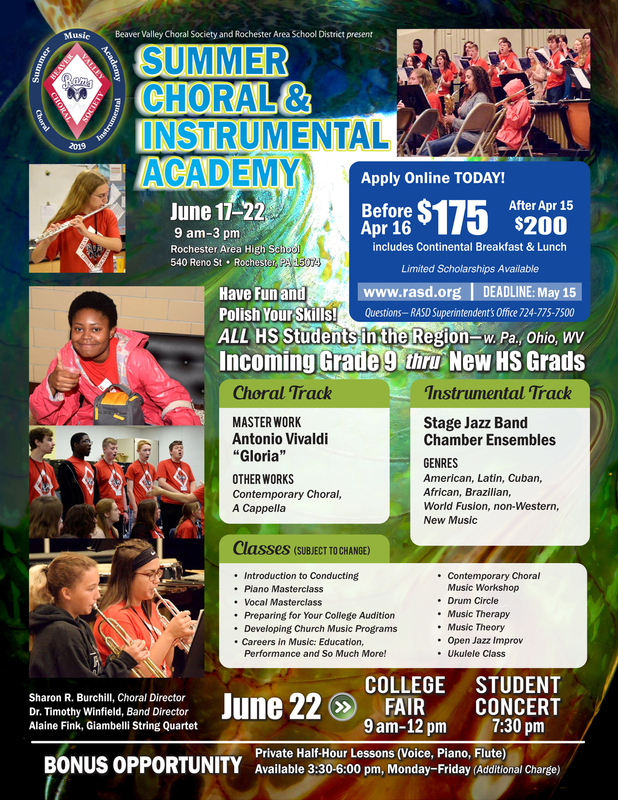 the 2019 Summer Choral & Instrumental Academy is for you! The Summer Choral and Instrumental Academy is open to all high school students, grades 8 through 12, and graduating seniors interested in extending their vocal or instrumental experience and performance opportunities. The high school student program offers intermediate and advanced music students the opportunity to work with renowned faculty in a challenging yet supportive environment. Students will participate in large ensembles, chamber ensembles, master classes and an array of music courses, seminars and clinics. Following the academy conclusion, a recording of the finale will be made available for purchase to all registrants. Optional: mini-voice or piano lessons (30 minutes). You can quickly register online by using the link on the left side of this page. Please complete and return the form by May 15, 2019. Apply early for acceptance into one of the four choral sections for the 2019 summer academy. Sectional seating will be limited to 15 sopranos, 15 altos, 12 tenors, 12 basses. Once a choir section seating has been confirmed for each chair, that choir section registration will be closed. Seating in each section of the choir is on first-come basis. Early application is recommended as the number of participants in each choral section is limited. Be among the first to apply for one of the limited seats in the Vocal Track Chorus for the 2019 Summer Academy! vibraphone, flute, piccolo, oboe, tuba or euphonium - "WE HAVE A PLACE FOR YOU!"